The Arizona Department of Transportation, in conjunction with the Federal Highway Administration, is conducting a three-year study known as a Tier 1 Environmental Impact Statement to meet the requirements of the National Environmental Policy Act and determine a preferred corridor for a proposed new highway to connect Interstate 10 and Interstate 19 south of the Tucson International Airport. 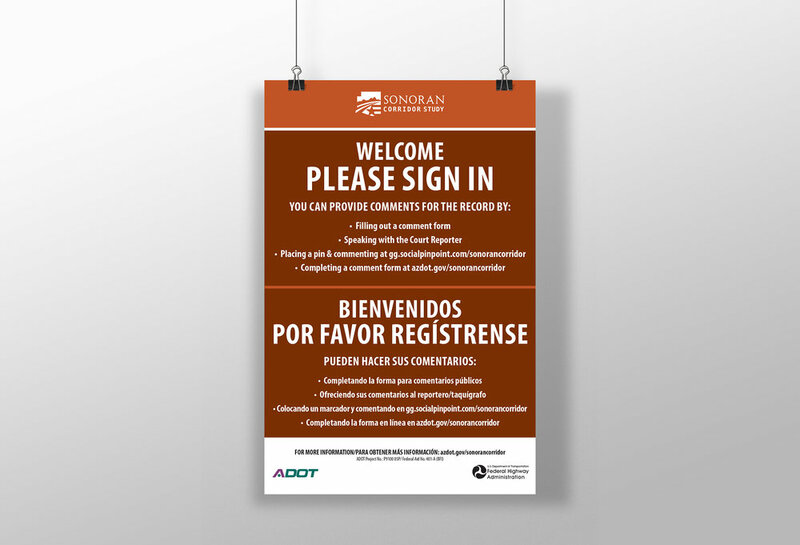 When ADOT needed assistance engaging the public and agency partners as part of the environmental study for the proposed Sonoran Corridor, they turned to Gordley Group. Our team developed a public outreach plan, created a distinct “brand” to identify the study and proposed highway and designed and created informational materials for a project website and for a series of public and agency scoping meetings. We worked with the ADOT and FHWA teams to prepare them for scoping meetings in Tucson and Sahuarita, assisted with the meetings and the comments received through a variety of approaches, including an interactive on-line map. Gordley Group will continue playing a pivotal role for the duration of the study, including two more rounds of public meetings and a formal public hearing. The public process has just begun, but the outreach effort, including local media coverage, has introduced Southern Arizona communities to the Sonoran Corridor and differentiated it from other similar studies, some completed and others on-going. The successful initial meetings have provided the study team with information that will help develop a “purpose and need statement” that will guide the process moving forward as well as determining the potential corridors that will be narrowed down during this “tiered” environmental process.